I have always been a huge Rachael Ray fan. I especially enjoyed her 30 minute meals show on the food network. I do enjoy her daytime talk show, but I must admit my favorite part is still the food prep part. To me the rest of the show is somewhat redundant and has a "been there seen that" feel to me. In my opinion she should stick with what she's great at (cooking) or at least showcase it more than the other stuff. Here is one of my favorite of Rachael Ray's recipes from her daytime talk show. Although when the show aired she did not boast the fact that it is naturally gluten free, but here I am to share one of my favorite recipes from Rachael Ray, with the gluten free world. I hope that others, like myself, will go ahead and give this one a try. It is a favorite in our gluten free household in Edmonton, that's forsure. So good that we jumped right in to eating and forgot to take a picture to show it off to our loyal readers. My appologies. Guess we'll just have to make it again. I did however snag a picture from Rachael's website for you to see, thank you Rachael Ray! **Here is where Rachael Ray & I differ- She follows this order and I do the reverse. I found that if I do the meatballs first and then work on the risotto, I can have better control of my timing. I’ve written it as Rachael Ray does it and it’s up to you how you prefer to prepare this dish. Place the tomato sauce and the stock in a medium saucepan and heat over low heat. Keep warm. In the last minute or so of cooking time, stir in butter until it melts and add ½ cup of cheese, a couple handfuls. Turn off heat and stir in basil. Meanwhile, in a mixing bowl, moisten the breadcrumbs with milk. Add egg, meat, parsley, ¼ cup cheese, salt and pepper to the bowl and mix to combine. Score meat into 4 sections and form 8 small balls from each section, the size of marbles. Place meatballs on a baking sheet and coat them with a liberal drizzle of Extra Virgin Olive Oil. Bake 5 minutes until cooked through and golden. 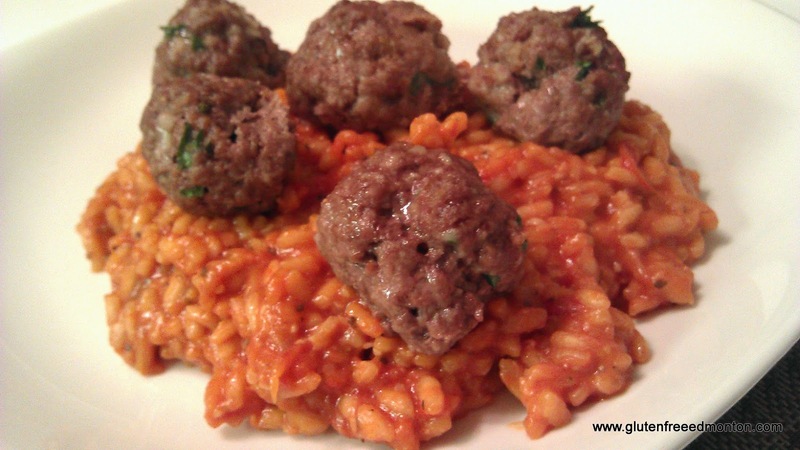 Serve risotto in shallow individual bowls topped with 8 mini-meatballs per serving.